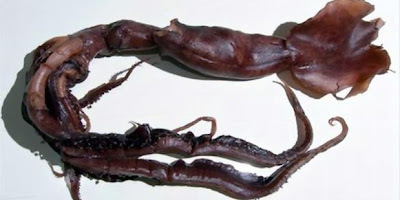 Scientists discover new species of squid in the Indian Ocean. The discovery was reported by the International Union for the Conservation of Nature, on Monday (11/15/2010). The species is included in the family Chiroteuthid. Species that are found to have a size of about 70 cm long has an organ that is able to emit light to scare the prey. According to the IUCN report, the species found at the bottom of a steep sea. So far, it has been found in 70 species of squid in the expedition. All squid species that represent 20 percent of species of squid in the world. "During these 10 days, scientists working with a microscope to identify various types of fish, squid and other interesting sea creatures," said Alex Rogers, a marine biologist from the Zoological Society of London. Carl Gustaf Lundin, Head of IUCN Global Marine Programme, said that the discovery of new species will not only satisfy the scientists who worked in the field. "This study is also useful for ecosystem management in the Indian Ocean and in the global marine ecosystem." The discovery of squid species were part of a research expedition aboard the research last year sailed the Indian Ocean to collect 7000 samples of living creatures from the depths of 1,200 meters.